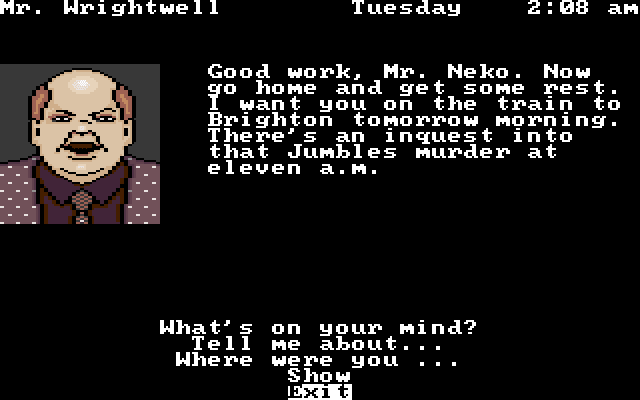 Because you like to see him suffer, mecha-neko is back with another point and click adventure guest post! 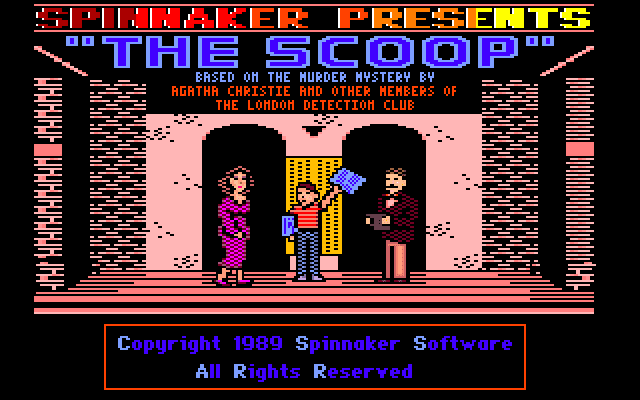 As an apology for the image heavy Mixed-Up Fairy Tales, we're going back to the low-colour eighties for "The Scoop". 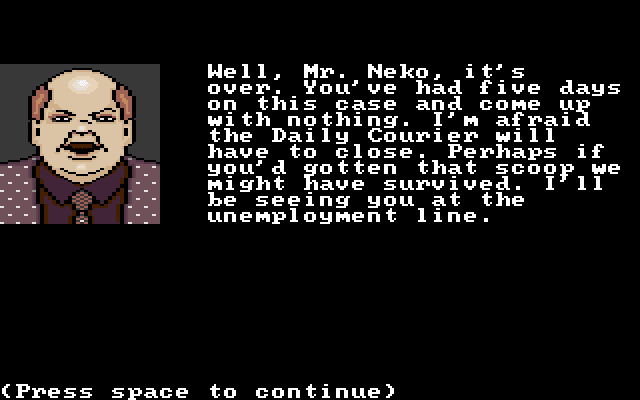 Gallant reporter Mr. Mecha Neko leaps up the Daily Courier's steps, eager to prove himself to his editor. 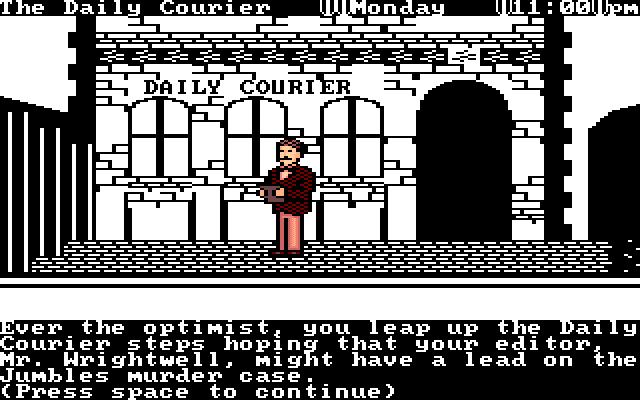 He falls flat on his face though, 'cause the Daily Courier doesn't have steps. That's Mr. Neko in the centre, clad in musty puce finery. 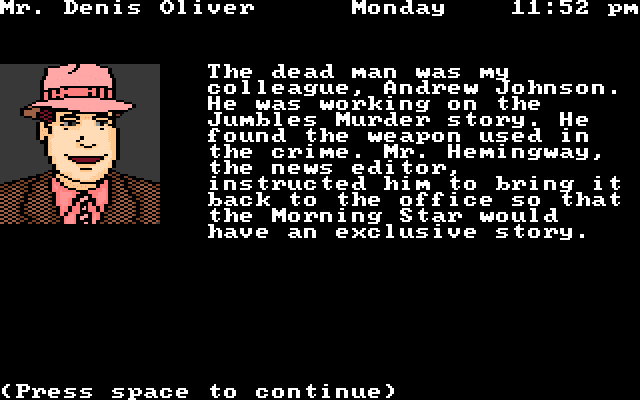 Throughout the game he carries a dead opossum, for reasons I don't want to know. There wasn't anybody inside the Daily Courier as it turns out, so I decided to go to the station instead. Let's talk to the friendly neighbourhood bobby for some advice. I guess he doesn't like opossums. Eek more! It's a crime scene! For some reason, the bobby doesn't mind reporters running about the place, mucking everything up. The balding man in the centre is a Scotland Yard inspector trying to get rid of the big-chinned reporter in the brown suit. Seems like pink shirts are the latest London fashion. Perhaps it's to make up for the monochrome world. I eavesdrop on their conversation. Turns out the murdered man was removing evidence from a different crime scene! Disgraceful behaviour. I help myself to some of the bits and bobs around the crime scene while they're distracted. 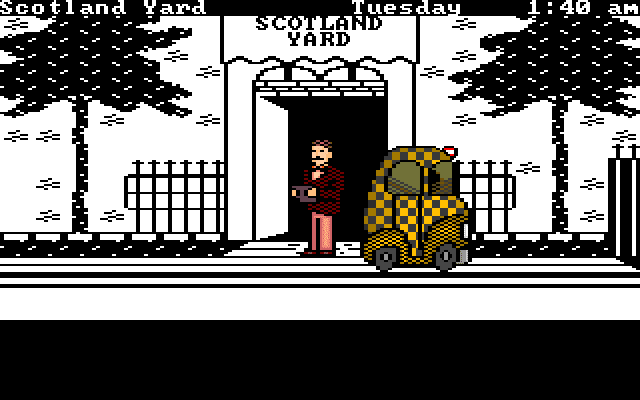 Time to visit Scotland Yard and see what I can wrangle out of them. Just bloody drive, will you? I hop out of my cartoon taxi and stride in, opossum at the ready. 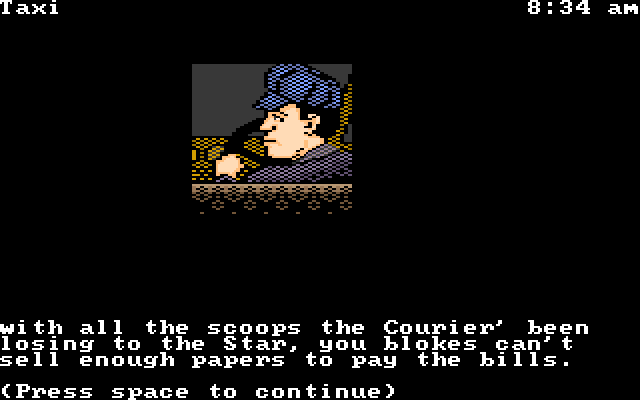 Accusing the chief of Scotland Yard of being a double murderer earns me no points. Now that he's in the office, I can report my amazing haul of crime scene evidence to the boss. He looks really, really tired. He's very impressed, so he has a job for me. I'm supposed to get on a train tomorrow and observe an inquest. Time to go to sleep. Without even a change of clothes after my stay on the bench, I'm off to the station. The cabbie reminds me that I'm on the brink of losing my job if I don't solve the murder. THANKS. I missed the train and screwed up. I shouldn't have taken things that I should have, should have said things that I didn't. The newspaper is ruined, and it's all my fault. The repo men took my opossum away and now I am very sad. 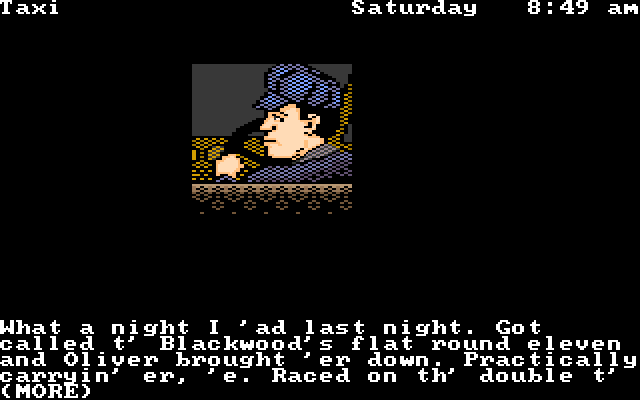 This game has a real time story, so if you miss certain things early on you're buggered. I didn't notice that the 'Travel' verb (which you use to get in the cab when on the street) works in the station (to let you get on the train). I also found it quite difficult to advance time to the end of the game so I could get to the game over screen. The first few times I tried it (after realising I'd missed things), I ended up going beyond the point where the boss is supposed to close the Courier. The day counter stared showing gibberish and characters starting doing very bizarre things. Eventually, the clock stopped at 11:59pm; I had reached The End of Time Itself. 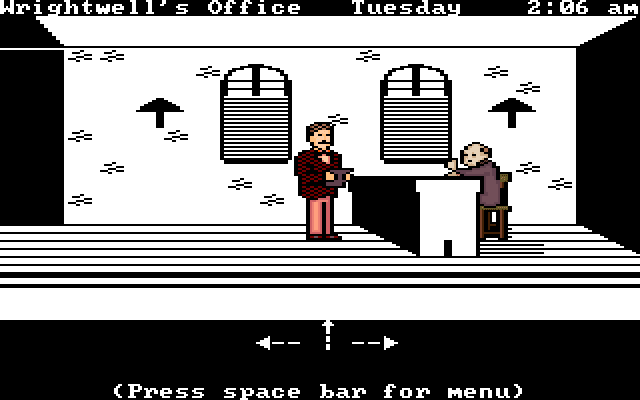 Even though this game is in the point and click adventures category, it doesn't use a mouse. 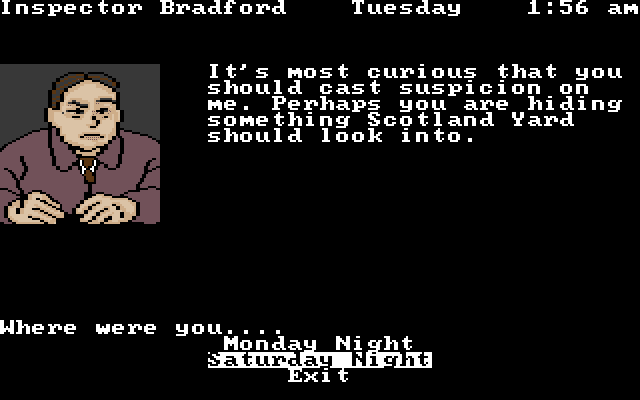 You control it with the cursor keys and the conversation options are very limited so it has a lot in common with those new licensed Telltale adventures. By that, I mean I think I'd rather eat the discs they come on than play them.